Interview and feature in Scandinavian MAN 3.
this is Sweden is a multidisciplinary platform founded by siblings Ana and Pablo Londoño. 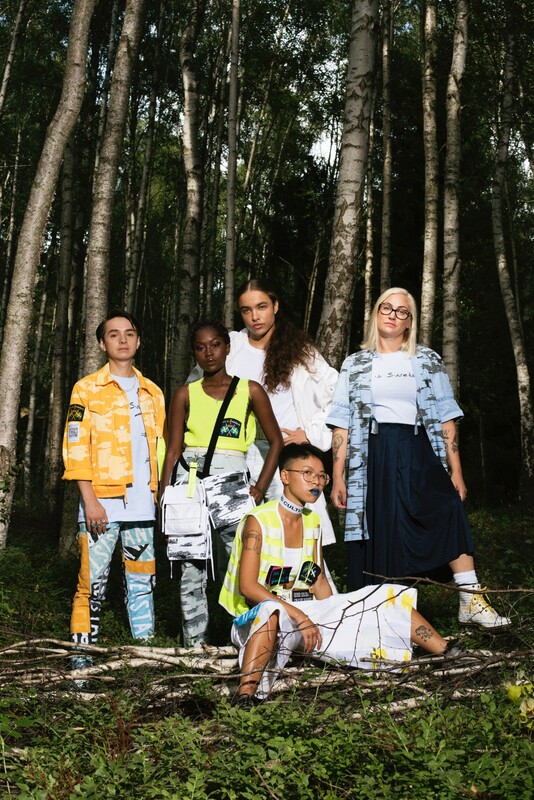 Their ideas are manifested in the clothes they design: through DIY-kits, simple t-shirts and customised jackets, they’ve found a way to be an anti-racism platform in the fashion industry. this is Sweden can be spotted in the front row of concerts, on the subway, in workplaces, on TV – there’s a growing army of accomplices. Pablo now runs the label, with support from the platform’s powerful family of supporters. FELICIA: What is the core of this is Sweden? PABLO: The core of the project is my sister and myself, and our experience as refugees coming from Colombia to Sweden. That was our starting point when we decided to work together. We were both fashion designers working in the industry, but ever since we were kids we always said that we wanted to work together. How did you continue from there? - In the autumn of 2013, Ana got a studio space to work in as she has just started freelancing. I was in-between jobs at the time, and considering we had always wanted to create something together, it felt like a ‘now or never’ moment. We sat down at the same table we still work around today and said: “Alright, awesome. Let’s make a collection.” The first thing that we acknowledged was that we wanted it to be more than pretty clothes for pretty people. A year earlier, Ana had moved back from London to Stockholm. She was on the subway reading in the newspaper that four out of 10 Swedes will vote for the Swedish Democrats in the coming elections. She was on the metro feeling like she was back home, while statistically, four out of 10 people in the carriage she was on thought she should “go home”. Ana and I began to discuss this. What rhetoric and trends were giving us déjà vu from when we were kids? We arrived in Sweden in 1991; the first big refugee wave to Sweden following the wars in the Balkans, Somalia, Eritrea and Ethiopia, and the Gulf War. You could see the entire world’s conflicts at this refugee camp in Säter. All our friends were from these various war-ridden countries. Meanwhile, you had skinheads walking the streets spitting racial slurs at you. So, for Ana and I, reading that survey in 2012 was one of the déjà vus. The same skinheads had now grown their hair and traded their bomber jackets and boots for suits. - Our concept and values for this is Sweden came from aiming our attention at the upcoming 2014 election. We were not politicians nor journalists, we were fashion designers with little apparent impact on politics. Fashion is known to be unpolitical. It rarely stands for actual change, it’s always just tagging along. We used our craft to address immigration, to question nationality, and challenge what it means to be Swedish. In 2018, it’s a widespread conversation - but in 2013 when Ana and I were sitting here, we were still confused about whether we were Swedes or Colombian. Now I know: I don’t need to choose, I am both. You’re empowered by your two cultures, and being a Third Culture Kid. We started out with our own stories, and I believe storytelling is a very powerful tool. As this is Sweden grows and changes, how will you proceed? What is your future? - Yesterday I went to the NCY Creates / Queer Basics event during Pride in Stockholm. A lot of people I’ve met through this is Sweden were there, and the love and knowledge we shared reminded me of why I’m doing this. It’s so easy to be overwhelmed by negativity, especially during election period. A lot of times I’ve thought, “Why are we even continuing when all we are doing is swimming against the current?” It takes so much effort. But to then hear from people that wearing something as simple as a T-shirt that says “this is Sweden” has empowered them, makes me think it’s worth it. I love the designing, I love geeking about details, but at the end of the day, what actually keeps me going is knowing that what we create matters. There’s this song I like that has a line, “No one is better than me, they just have better marketing schemes.” I like that. Sometimes I think about why we haven’t grown more. Then it hits me. We are busy walking the walk, instead of talking the talk. We have a strong community. It’s not like we set out to have that either, it just naturally grew. Instead of seeing that we have this amount of retailers - which many brands measure their success on - we recognise that we have this amount of people in our family. I wanted to talk to you about some of the projects within this is Sweden too, such as This is My Vote, and the Cereal Talks. I think the conversations you’re establishing with those platforms really are needed. - This is My Vote was actually a project started by Jon Aagaard Andersson, poet and long time collaborator of ours. They came to me and explained their idea of an event for first time voters in the general election. I thought that this is something Ana would have organised. Within the duo, Ana was always the front figure. She used to say that there are too many dudes taking up the spotlight. So, when Jon came up with the idea I asked how could we help them out. On the day of the event so many young people showed up, and they have since held their own This is My Vote meetings within their own communities and in other cities in Sweden. Since last year, I was thinking ‘What are we going to do for the 2018 election… Should this is Sweden host a massive thing?’ Then I reminded myself, ‘No, remember: small steps.’ That’s where the Cereal Talks came in and the concept is simple. Invite people to come and have breakfast with an inspiring speaker – we sit and talk and eat cereal. That’s it. No stage, no mics, no projected presentation, just a chat with somebody with a refreshing perspective. We deliberately try to have speakers from outside of Sweden to break us out of our Stockholm-bubble. To meet people, to share experiences - that’s the work process I prefer over some massive event that goes “Boom!” and then loses attention to the next shiny thing. Slow and steady wins the race.